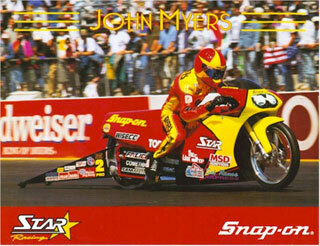 It was on Aug. 9, 1998, that one of the greatest Pro Stock Motorcycle drivers in the history of drag racing passed away – in a street bike accident, nonetheless. 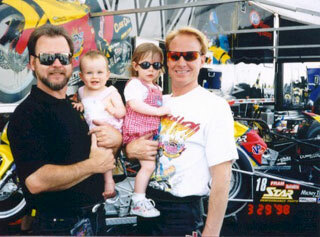 It was on that day that John Myers, at the age of 40, left behind a legendary career, friends, admirers, and most importantly, his wife, Kerry, and his then 22-month-old daughter, Christina. Strange to think how one day one man can have so much, and the next, how one family could lose so much and have so little. 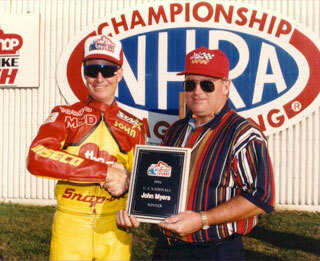 It was with that sad reality, close friend and fellow Pro Stock driver, Steve Johnson, begun the John Myers Memorial Foundation. The idea of leaving his family alone at such a young age had never crossed Myers’ mind. His success on the track did not follow him into his finances. Kerry was left alone with a young daughter to care for, but without the money to do so. The foundation brought out the masses of loyal legions from the racing business. The late Dale Earnhardt, Rusty Wallace and John Force donated precious memorabilia to be auctioned off, with all the proceeds going to Myers’ family. Fans from all over the country also showed their support by making contributions. It was a case of Myers having his wonderful spirit for life being paid back to him and his family. The entire racing community had reached out and given back the nurturing hand to his family that he had given to the sport. “They absolutely would not have been able to keep their house,” Johnson said. Myers was a superstar who took the time to sign autographs and to talk with fans that admired him so much. He was also a serious competitor, though, staying calm just before his races. He was a comedian as well and loved to make pig noises at his crew chief George Bryce. “I don’t know of a single person who could say a bad thing about the man,” Molliston said. 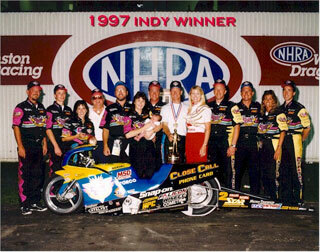 To this day, Kerry Myers is extremely grateful for all the help she received from the racing community. She was able to go back to school and received a degree from the University of Alabama-Birmingham, all while being able to put Christina in a daycare center. She also has wonderful memories of John. For Johnson, there was no question of what he had to do. He had drawings and t-shirts printed to raise money, t-shirts he still wears to this day and endlessly pushed and sold at the races.